Huangguoshu waterfalls is located in the upper reaches of Baishui River in Zhenning Buyi and Miao Autonomous County, Anshun City, Guizhou Province. It is 45 kilometers southwest of Anshun City, and 150 kilometers northeast of Zhenning Buyi and Miao Autonomous County.Click Here For More. This waterfall belongs to the middle subtropical zone and is a typical karst area with mild climate and abundant rainfall. The annual rainfall is over 1300 mm. Rainfall is concentrated in May-July. The monthly average rainfall is over 200 mm. Especially in June, the monthly average rainfall is nearly 300 mm. The precipitation decreases gradually in the following months. December is the lowest monthly precipitation in the whole year, and the monthly average precipitation is less than 20 mm. The maximum rainfall in a month is about 15 times that in a minimum month. Huangguoshu Falls is located in the low-lying area of Western Guizhou, with low altitude, frost-free all the year round, annual average temperature of about 14 degrees Celsius, no severe cold in winter and no hot summer in summer, Click Here For More. it is a summer resort. January is the coldest, with an average temperature of 4.3 degrees Celsius, but the lowest temperature rarely drops below zero; July is the hottest, with an average temperature of 22 degrees Celsius, there will be no high temperature days. Behind the Huangguoshu waterfall, a 134-metre-long water curtain tunnel crosses the waterfall, consisting of six windows, five caverns, three holes and six channels. Watching the waterfall from the water curtain cave is breathtaking. 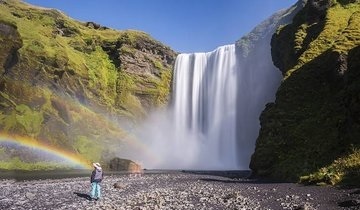 Such a magnificent waterfall under the water curtain hole, waterfalls around the world is also rare.